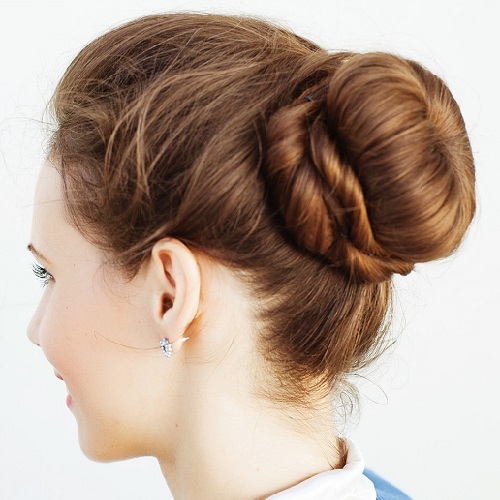 3 Super Pretty (And Fancy) Buns That Need NO Heat Styling! 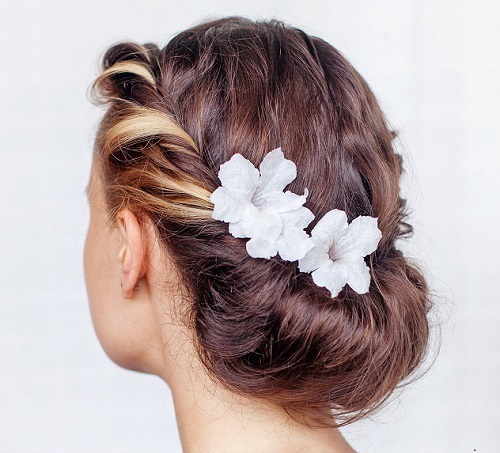 Got a big wedding to attend and want to try something different with your hair? We give you some fabulous updos that look oh-so fancy and require just a few minutes to achieve. Forget about spending hours in the parlour, you can do these yourself without any heat styling too! Get ready to ‘wow’ people at your friend’s sangeet or cousin’s mehendi with these pretty updos that need no heat styling. Step 1: Brush your hair to remove any knots and create a middle parting. Step 2: On the right side of your parting, take a section of your hair from your hairline up to your ear and twist it in an anti-clockwise direction. Twist as tight as possible so that no stray strands escape down the length of your hair. Step 3: Pull the twisted section to the back of your head and secure it in place at the middle with a hair clip. Step 4: Now take a section of hair on the left side of your parting and do the same. But this time, twist in a clockwise direction. Pull the twisted section back behind your head, remove the clip and tie the 2 twisted sections together with a hair tie. Step 5: Now, gather all your hair and roll it up from the ends. Tuck the roll into the ‘belt’ formed by the twisted sections that you tied together. Secure with bobby pins. Remember, the longer and thicker or heavier your hair is, the more pins you’ll need. Step 6: Make sure to tuck in any strays. Spritz a light spray to keep your strands and the bun in place. This isn’t an essential step but it helps the style stay in place longer, especially if your hair is prone to frizzing. You can add a touch of ‘princess’ to your look with an embellished pin or flower clip to dress up the do. Step 1: Brush all your hair back from your face so you don’t have any obvious parting. Step 2: Take a small section of your hair across your hairline (from one temple to the other) and make a tight, plait down your crown till you reach the middle of the back of your head. Secure it with a hair tie. Step 3: Gather the rest of your hair into a ponytail and tie it. The base of your ponytail should be the bottom of your plait. Fasten it with a strong hair tie that is the same colour as your hair. Step 4: Brush out your ponytail to make sure it’s smooth and tangle-free. 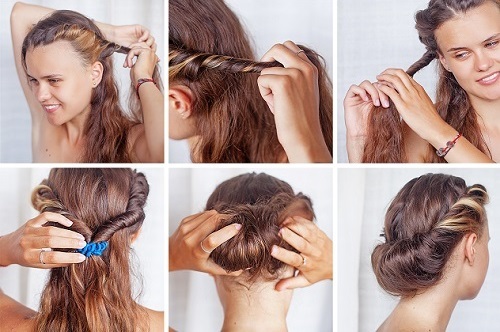 Give the whole length a slight twist and tie an elastic at the ends. Step 5: Now start rolling the entire length upwards, starting at the ends. Be extra careful not to let any strands escape your roll. Step 6: Roll right up to your crown (where your plait ends). Pat the roll down into a semicircular shape (along the curve of your crown) and secure it in place using bobby pins. Step 7: Slide on the hair band to add a dash of glam to your updo! Step 1: Brush your hair to remove any tangles and create a centre parting. Now, split your hair into two sections - front and back. Tie the back section into a medium-high ponytail. Step 2: Take the hair that you’ve left loose at the front and run a dollop of hair mousse along the strands. You want your hair to stay sleek in order to avoid any strays and flyaways. Step 3: Take a fine-tooth comb and tease the roots of the loose hair. Adding a bit of volume in the front will prevent it from looking flat when it’s all pulled back into your final bun. Step 4: Slip a hair donut down your ponytail and fit it firmly around the base. Spread the hair of your ponytail around the donut, covering it completely. Secure your donut bun at the base with a hair tie. Step 5: Now wrap the length of your hair around the base of the donut bun to cover up the hair tie. Secure the strands in place with bobby pins. Step 6: Now twist the hair in the front, on the left of your parting and pull it back. Wrap the length around the base of the bun, and fix in place with bobby pins. Do the same for the right side too. And you’re done! 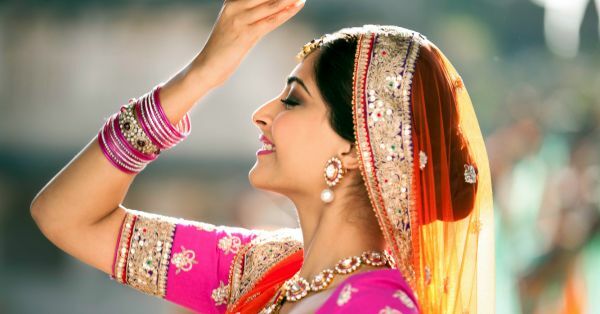 Add a pretty maangtika to make it look extra festive. Images: Shutterstock HAVE A STORY IDEA FOR POPxo? If you want to hear about it, we can write about it! Just tell us your idea here! MUST READ: Fancy Wedding Hairstyles For The Short-Haired Girl? Oh YES! MUST READ: Not Just Buns! 7 Gorgeous Bridal Hairstyles You’ve Got To Try!